Free Fishing Reports > Northeast > New York > North Shore > Otto and The Capt. hit them HARD !!! 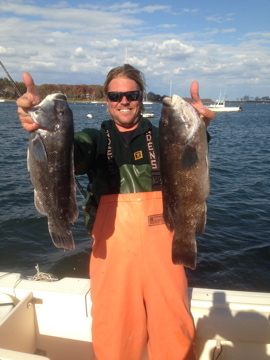 A beautiful November day was perfect for Head Dockmaster Otto and Capt. Skip to go out and slam some quality Blackfish. The bite was a bit picky at first, but then all hell broke loose !!! Both men were slamming the Blackfish non-stop …both limited out quickly, then had a catch and release free for all. All keeper Tog were in the 3-6 lb. class, and will be enjoyed for many dinners to come…Way to Go Otto !! !